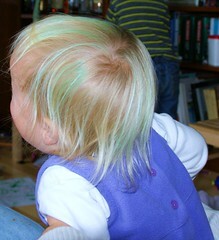 I showed Dad the photo, given I have strongly recollect him going on about wanting green hair throughout my childhood. On seeing the photo, he was rather impressed, and went on to explain where the obsession with green hair had come from. As a small boy he'd seen one of the first technicolor movies The Boy with Green Hair, and although it had freaked him out, he'd taken a shining to green hair. When I questioned him about what age he had been when he saw it, dad explained he'd seen in late 40s... in black and white! I guess kids had more imagination in those days! It was NOT B & W .,., it just wasn't very coloured !